A very popular antenna for multiband use is a centre fed dipole with open wire feed line to a balun/ATU. Though there is not a requirement for a specific feed line length, some feed line lengths may result in a load that the ATU is challenged to match efficiently or at all, or that cause extreme voltages in the balun or ATU leading to flashover and possibly permanent damage to components. For many implementing this type of antenna system, the traditional advice is to use as little feed line as comfortably reaches from antenna feed point to the balun/ATU, and if problems occur with matching or flashover on some bands, to lengthen the feed line a little and try again. That approach suits many, but it might suggest that what is happening is somewhat haphazard and unpredictable. That is not true, and this article explains the problem and a method of designing to avoid flashover problems for those interested. This method assumes that the balun/ATU does not consume significant power, even at extreme voltages. That assumption is reasonable for good Guanella 1:1 current baluns, but does not necessarily apply to voltage baluns, particularly those with ferrite cores. The method involves 6 steps as follows. For example, lets use Zo=400Ω (the actual characteristic impedance of popular commercial nominal 450Ω lines). Manufacturer's may publish maximum voltage ratings for ATUs and baluns. You need to ascertain whether they are quoting the instantaneous peak voltage or RMS. Beware though, manufacturer's / sellers of ham gear are known to be quite extravagant in their specifications. In the absence of realistic manufacturers ratings, you will need to guestimate the values. The T match tuner is very popular, so lets discuss it. A rationally designed commercial product is probably limited by voltage breakdown of the variable capacitors, and for some loads, the voltage across one capacitor is likely to be close to the output terminal voltage. 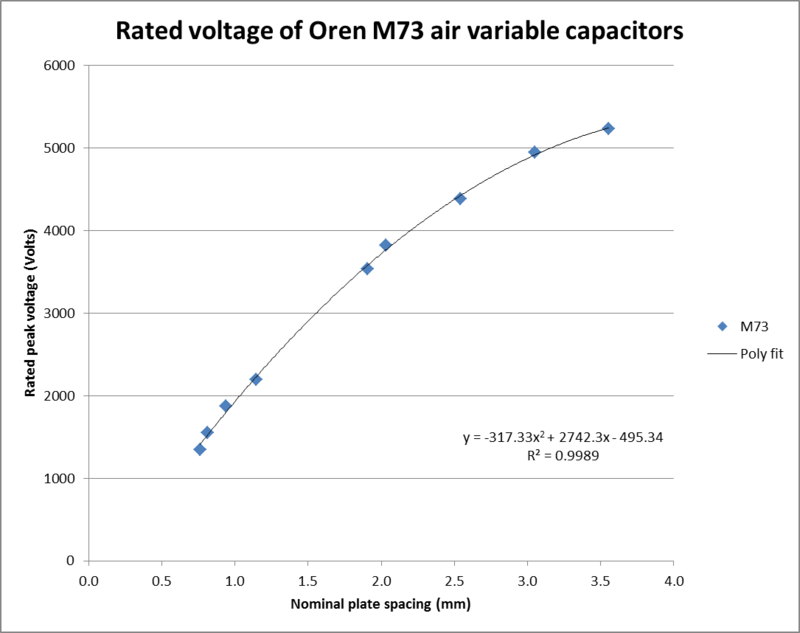 Above is a plot of Oren's peak voltage rating of the M73 series variable capacitors against nominal plate spacing, and a polynomial curve fit. This data could be used to estimate the breakdown rating of a quality capacitor from measurement of the nominal spacing. Note that play in bearings, poor plate to plate spacing etc all degrade the breakdown rating. Whilst the voltage rating might not seem to reconcile with Pashen's law, it takes much more into account. For example, a nominal plate spacing of 1mm indicates a peak voltage rating of about 2000V. Rating the insulation between windings in a balun is more difficult. Baluns often depend only on the enamel on enamelled copper wire (ECW). There are different grades of enamel, but this type of construction does not achieve the highest breakdown voltage. Wires in PTFE sleeve, PTFE insulated flexible wires, or coaxial cable, especially larger and PTFE cables usually have better withstand. Wrapping ECW in plumber's PTFE thread tape seems quite a waste of time, it will cut through under quite light physical pressure. ECW might be good for up to 500V between conductors, Thermaleze or the like might be good for 2000V or more, PTFE sleeved wires will usually quite exceed that. Loads are often expressed as an equivalent complex impedance (Z) of some resistance in series with some reactance, often expressed in complex notation as R+jX. The load can also be described as an admittance (Y) which is the inverse of impedance, Y=1/Z (remembering that Z and therefore Y are complex quantities, they have real and imaginary components. Admittance is if you like, a parallel equivalent circuit, Y=G+jB where G is the conductance and B is the susceptance. You know that the real power in a series circuit is given by P=I^2*R. We can also say that real power in a parallel circuit is given by P=V^2G. Lets rewrite that last expression in terms of Vpk instead of Vrms (which is implied by the notation) for a sine wave, P=Vpk^2/2*G.
Rearranging the last expression and writing in terms of maximum allowable Vpk (ie maximum safe working voltage), Gmin=2*Pmax/Vmax^2 (Vmax being the maximum instantaneous voltage allowable). For example, if we have determined that Vmax is 2000V and Pmax is 1000W, then Gmin is 2*1000/2000^2=0.0005S. This is an important parameter, if the load conductance component at a point in a transmission line is less than Gmin, the differential voltage will exceed the safe working voltage at the required maximum power level. 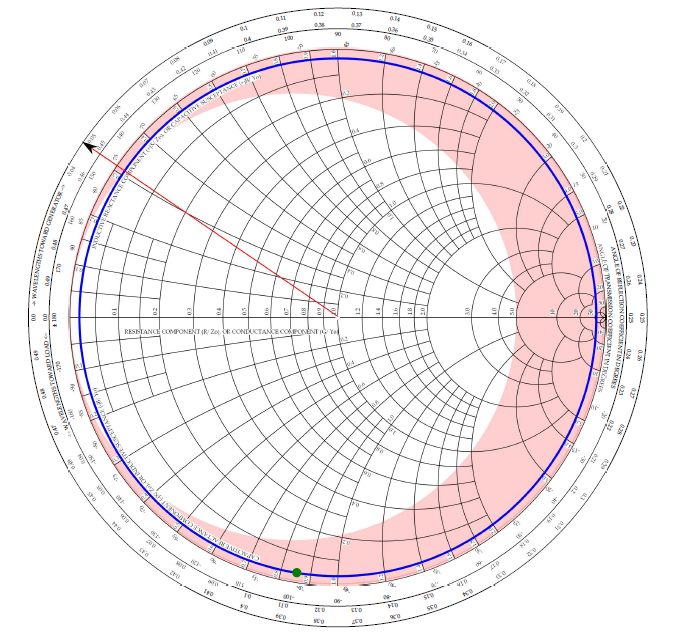 A Smith chart is an ideal tool for visualising the design problem. The safe conductance zone inside the Gmin value or 0.0005S in our example is easily plotted in the Smith Chart. Above, the boundary between the white area inside the chart and the pink zone is the normalised Gmin, G'=0.2. You could use Smith chart stationery that has admittance circles shown, or do as I have done in using a compass to lay off the distance from the chart centre to R=0.2, X=0 in the opposite direction from the centre so converting to G=0.2 (and B=0). You can then construct the critical admittance circle by placing the compass point at a point midway between the point last marked (G=0.2, B=0) and the left hand end of the X=0 axis (R=0,X=0) and drawing a circle that passes through both of those points. We have now charted the no-go zone, the area outside the critical Gmin circle. Note that if VSWR<1/Gmin', the entire VSWR circle falls within the safe area. In this case, if Gmin'=Gmin/Yo=0.005/0.0025=0.2, then if VSWR<1/0.2 or <5:1, then the entire VSWR circle is in the safe zone and voltage is safe at any line length. This condition can also be written as VSWR<1/(Zo*Gmin). For the example where Zo is 400Ω and Gmin is 0.0005S, if line VSWR<1/(400*0.0005),<5 then Vmax is not reached at any line length, and conversely if VSWR>5, Vmax is reached at some line lengths. For this example, lets take a G5RV length dipole at 80m, and feed point impedance to be 10-j340Ω at 3.6MHz. Normalise this Z to plot on the 400Ω chart, so Z'=0.025-j0.85 and plot the point. It is the green dot on Fig 2. To stay in the safe voltage zone, the transmission line must end somewhere in the white zone in Fig 2. Reading from the chart, one bound on acceptable length is marked by the red line at 0.048λ beyond a current maximum, and there is a similar zone the other side of the current maximum. So, the first current maximum occurs at 0.11λ from the load, so acceptable length is from 0.11-0.048 to 0.11+0.048=0.062λ to 0.158λ, and these zones repeat very half wavelength. Allowing for velocity factor, these translate to 4.66m to 11.88m. The zone from 11.88m to the next safe zone starting at 42.24m is a no go zone. A random length of line has a 30% probability of being suitable! 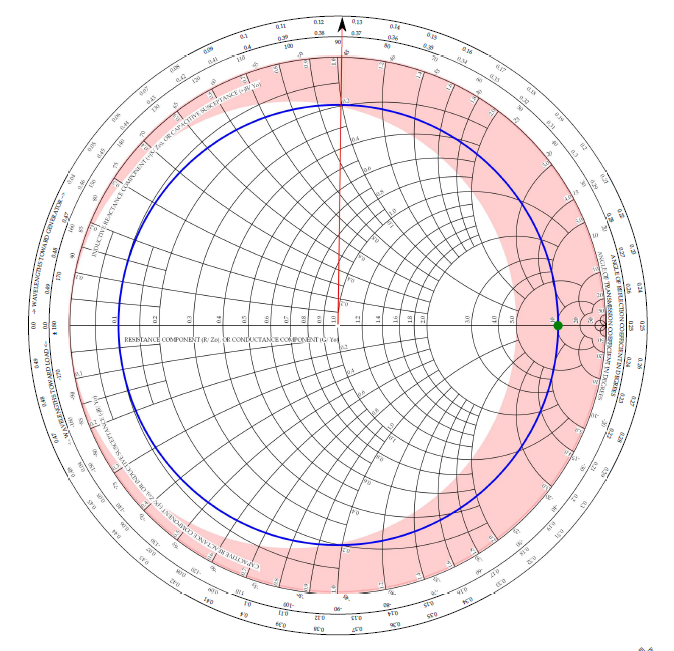 Line loss can be allowed for in the standard way for Smith chart operations. The line loss for the particular length is found, and the point on the VSWR circle is adjusted towards the centre by the required distance. The loss of most practical lines is so low that there is little improvement in accuracy of the graphical solution. A better way to take line losses into consideration is an analytical solution using a calculator of some kind. Solving this problem often involves working in the extreme outer margin of the Smith chart, and the accuracy of graphical solution is not good. Calculators can provide much better answers. Calculators can be used for arrive at the same information. Lets walk through TLLC on the above example. Taking Wireman 551 line, Zload to be 10-j340Ω at 3.6MHz, and Gmin to be 0.0005S, it can be found from repeated trials seeking Yin=0.0005+jB that the upper limit of the first safe zone is 12.50m (as opposed to 1.88m from the simpler analysis above). The same technique can be used with TWLLC for user specified open wire lines. A model in 4NEC2 can be built including TL elements to represent the transmission line. Note that TL elements are lossless lines. 4NEC2 calculates and displays a parallel equivalent circuit in terms of Rp and Xp, and the critical value of Rp is 1/Gmin, so in the example above Rp must be less than 1/0.0005=2000Ω. The length of the TL element (or the dipole) can be varied to obtain a sufficiently low Rp. A voltage balun's loss can be represented as a equivalent shunt admittance, and the G component may be relatively high. Whilst that appears in parallel with the admittance looking into the line, and so adds to it, increasing G, it does so at the expense of system efficiency. You could measure the voltage balun and factor it in, but a better idea for extreme voltage is to not use a voltage balun, use a current balun with adequate insulation. Having measured some popular voltage baluns to have equivalent shunt G as high as 0.0003S at some frequencies within their specified working range and capable of perhaps 20W of dissipation, and since P=Vpk^2/2*G, they are not suited to a peak voltage of more than about (2*P/G)^0.5=(2*20/0.0003)^0.5=365Vpk continuously at those frequencies. Using modes where average power is much less than PEP (eg SSB), higher voltages may be sustainable without exceeding safe dissipation. Do flashovers cause permanent damage? Some insulation materials are self healing (eg the air dielectric capacitor), but some are not. It is best to avoid any arcing because it may lead to permanent damage. Even in the case of air dielectric capacitors, whilst the dielectric may self heal, an arc may cause damage to the metal surface which makes arcing at that spot easier in the future. Does a 4:1 current balun help? A 4:1 balun means that Gmin on the antenna side of the balun is four times that on the other side (so long as the balun can withstand the voltage implied). That extends the safe zone, but it does so at the expense of ATU efficiency on lower impedance loads that occur closer to the current maximum. Yes, there is an optimal Zo for a given load. The Zo that gives minimal VSWR on the line will give a lower voltage maximum. For the example load 10-j340Ω above, Zo around 330Ω gives the lowest VSWR (~59) and the lowest magnitude voltage maxima. Lines of higher or lower Zo will give rise to larger voltage maxima. Isn't this all just a G5RV problem? A G5RV length dipole was used in the example above to demonstrate the effect, partly because it is not so extreme as to be impossible to read off the Smith chart. Another popular multiband antenna is to take a 133' centre fed dipole with open wire feed (Ford 2004). It is prone to quite the same problem, though perhaps not as severe, depending greatly on the choice of Zo. It may be that using 300Ω feed line does not give rise to critically high voltages whereas 600Ω line may at some lengths. Fig 3 shows the case of the 133' dipole on 40m with 400Ω feed line. The 133' centre fed dipole with open wire feed is not the no-brainer multiband antenna often recommended. Not only does operation in the pink zone cause high voltages, but it may challenge the ATU. In his article, Ford warns of the problem and offers a solution You may discover that you cannot achieve an acceptable SWR on some bands, no matter how much you adjust the tuner. Changing the length of the feed line may resolve this problem . Changing the feed line length may result in operation outside the pink area. Isn't the Rule of Thumb to always feed at a current maximum best? Feeding at a feed line current maximum means you are feeding at a voltage minimum. That may necessitate an unnecessarily long line, extra line loss, worse ATU loss, and may be impossible for a whole range of worthwhile multi band dipoles. It might seem easiest, but it certainly is not "best" overall. Is the "odd eighth wavelength" feed line a solution? No, not for all cases. Taking the example load used above of 10-j340Ω, fed with 3/8λ of Wireman 551, TLLC gives Yin=0.000067+j0.000202S. At 1kW, Vpk=(2*P/G)^0.5=(2*1000/0.000067)^0.5=5460Vpk. Would this idea work for a 102ft doublet? AK4YA asked at (eham 2012) Would this idea work for a 102ft doublet? He proposed to use 100' of nominal 450Ω ladder line to feed a 102' centre fed dipole. Among the responses, WX7G regurgitated the common ham advice [t]he correct length of ladder line is whatever gets from the antenna to the antenna tuner . This shallow advice ignores amongst other things, the voltage that might be developed at the ATU/Balun. Taking for example the dipole feedpoint impedance at 3.6MHz to be 10-j340Ω, and using TLLC to find the input admittance of 100' of Wireman 551, Yin=0.000072+j0.000703S. At 1kW, Vpk=(2*P/G)^0.5=5300V which would challenge most ATUs and Baluns. Conversely, taking for example an MFJ949E ATU with 1000V capacitors, the maximum safe power level would be P=Vpk^2/2*G=1000^2/2*G=36W, way less than its 300W rating. So in answer to AK4YA's question, that configuration will present extreme voltage at the input to the feedline on the 80m band, challenging both ATU and Balun. My thanks to Jim Lux and Tom Rauch for discussions during the workup of this article. eHam discussion. Sep 2012. Would this idea work for a 102ft doublet? http://www.eham.net/ehamforum/smf/index.php/topic,85343.0.html (accessed 20/09/12). Ford, S. March 2004. The Classic Multiband Dipole Antenna In QST Nov 2011: 40-41.